I recently had the opportunity to head down to the Niagara Region for the 21st Annual Icewine Festival, my first time down to experience this event. I am a huge fan of Ontario Icewines and I was excited to use the Discovery Pass (still available for $40, more information here) to try some Icewine inspired wine and food pairings. As I was flying solo I had to be careful of my alcohol consumption and limited myself to four wineries over the two days I was down. One of the great things about the Discovery Pass is that it can be split between all the weekends that the Icewine Festival runs as well as between people. On this trip I visited Fielding Estate Winery, Redstone Winery, Megalomaniac/John Howard Cellars of Distinction and Inniskillin Wines. 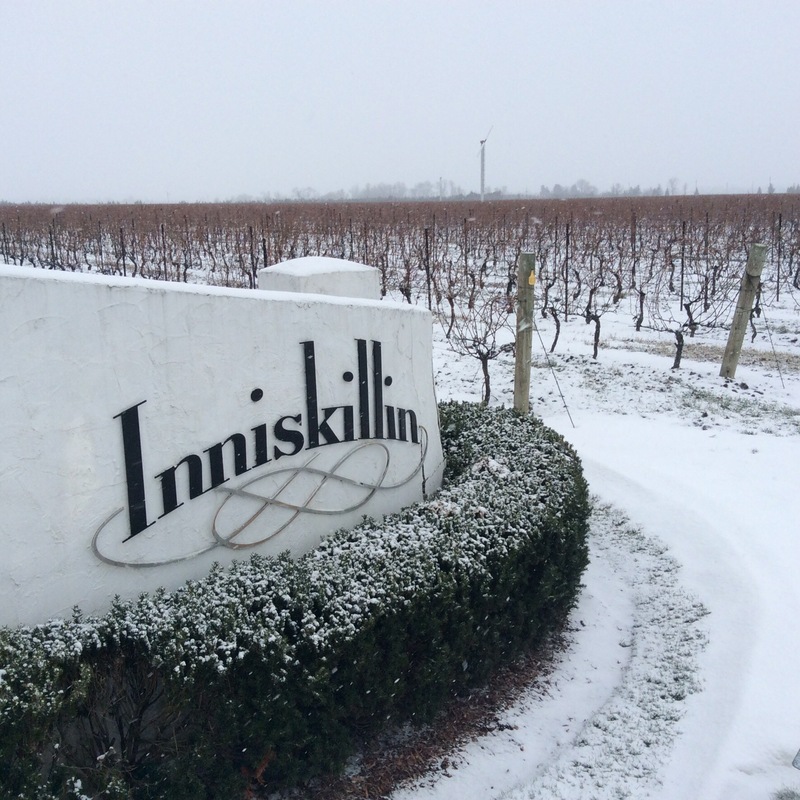 My final post from my first tour, here are the details from my snowy stop at Inniskillin Wines. From the Niagara Icewine Festival brochure – Northern Cool Meets Southern Warmth … Warm up this cold winter with our own take on the southern favourite, Chicken and Waffles, spread with our classic Riesling Icewine Butter. 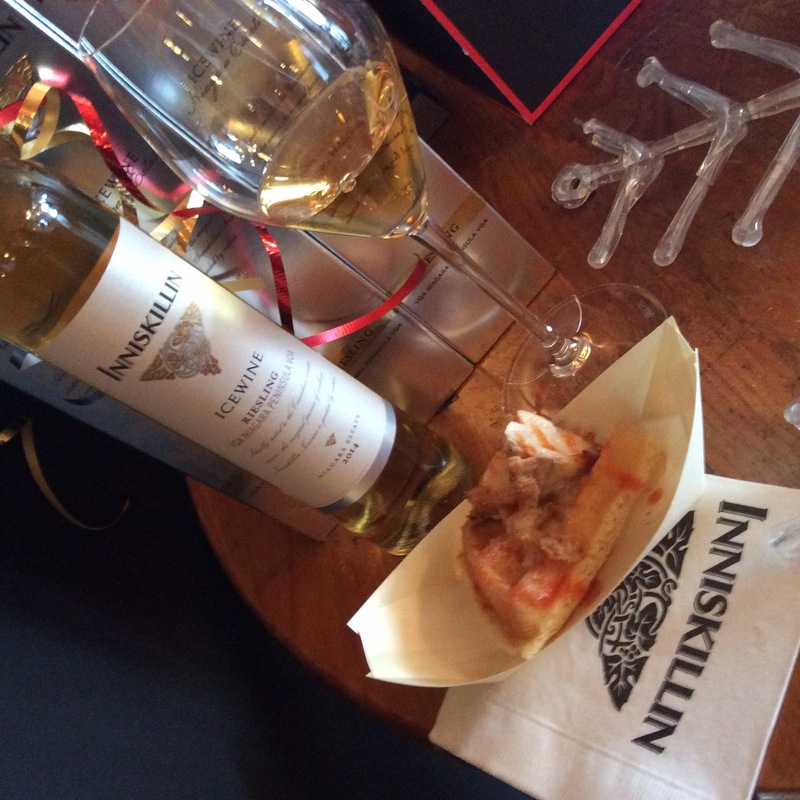 Enjoy this warm pairing with Inniskillin’s cool and highly awarded Riesling Icewine. My only stop on the Sunday, a light snowfall added to the ambience of this classic Niagara winery. 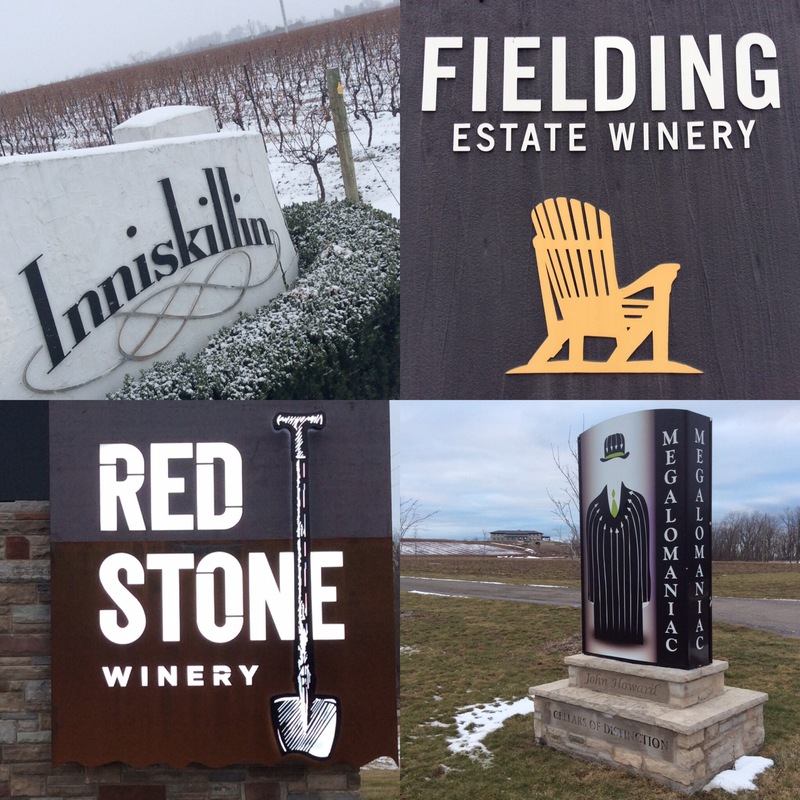 Inniskillin Wines makes one of my most favourite things, Sparkling Icewine, and I was elated to see they had offerings of both their Vidal and Cabernet Franc versions in addition to the Discovery Pass pairing listed above. Although listed as a warm pairing, the sample I got warm room temperature, not surprising considering the sheer volume of people through the doors. I’m a fan of chicken and waffles and this take with some Icewine elements added, in the form of the Icewine Butter and Icewine Hot Sauce, was a delicious mouthful. 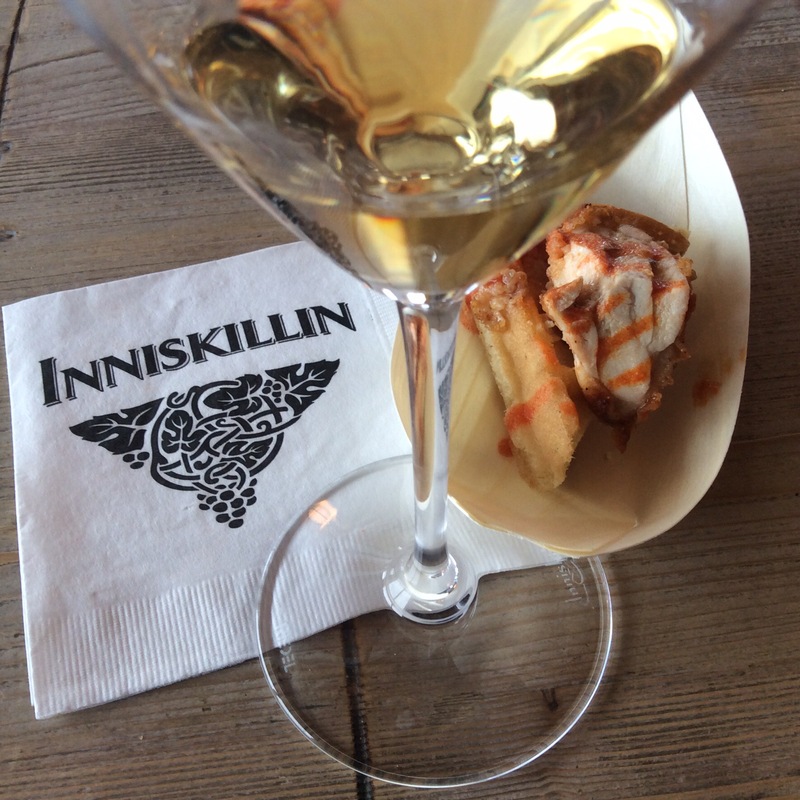 The 2014 Inniskillin Riesling Icewine VQA Niagara Peninsula VQA was a wonderful pairing with the sweet, salty and savory heat from the chicken and waffles. This Riesling Icewine was typical excellence from Inniskillin with a vibrant yellow-gold hue leading to aromas of golden ripe pineapple and honeyed guava, following through with a sweet and balanced punch of tropical fruit and a vibrant seem of acidity making this refreshing and happy, warming and delicious. The Icewine Butter was the key ingredient, adding a layer of texture to bring all the components into harmony across the palate, the sweet-salty-heat-creamy profiles all playing together nicely. 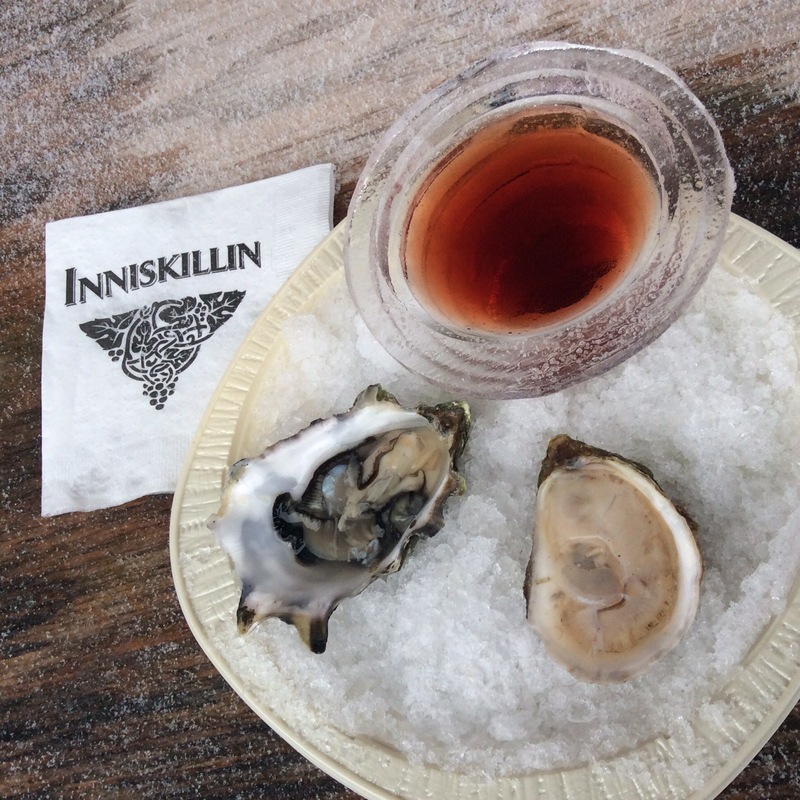 From the indoor tasting room to the tasting bar outside, I ordered the 2012 Inniskillin Sparkling Cabernet Franc Icewine VQA Niagara Peninsula VQA and went with the White Sparkling Icewine pairing, the raw oysters, instead of the ‘Smores offered with the Sparkling Cabernet Franc Icewine. I lucked out to get one of the remaining Fanny Bay West Coast oysters, and a Malpeque from the East Coast. An Icewine mignonette was offered along with generic cocktail sauce and lemon, I went with a splash of the mignonette on both of the oysters. Both were cold and fresh, tasting like the smell of the ocean with a tart sweetness from the garnish. I have tried the Inniskillin Sparkling Vidal Icewine in the past but had yet to try the Sparkling Cabernet Franc Icewine and was super excited to see it offered. Wow! The 2012 Inniskillin Sparkling Cabernet Franc Icewine VQA Niagara Peninsula VQA was outstandingly astounding! Served in a frozen art deco ice saucer, the deep reddish brown colour had a muted nose that opened up with the first sip of this amazing nectar. The delicate fairy bubbles whispered sweet nothings as they danced across the palate, revealing a cacophony of aromas and flavours: cranberry tart, barbeque ribs, peach pie, strawberry jam. I found this to be true happiness in a glass, effervescent excellence remarkable in its verve and function as pure luxury, a fitting end to my first visit to the Niagara Icewine Festival. I recently had the opportunity to head down to the Niagara Region for the 21st Annual Icewine Festival, my first time down to experience this event. I am a huge fan of Ontario Icewines and I was excited to use the Discovery Pass (still available for $40, more information here) to try some Icewine inspired wine and food pairings. As I was flying solo I had to be careful of my alcohol consumption and limited myself to four wineries over the two days I was down. One of the great things about the Discovery Pass is that it can be split between all the weekends that the Icewine Festival runs as well as between people. On this trip I visited Fielding Estate Winery, Redstone Winery, Megalomaniac/John Howard Cellars of Distinction and Inniskillin Wines. 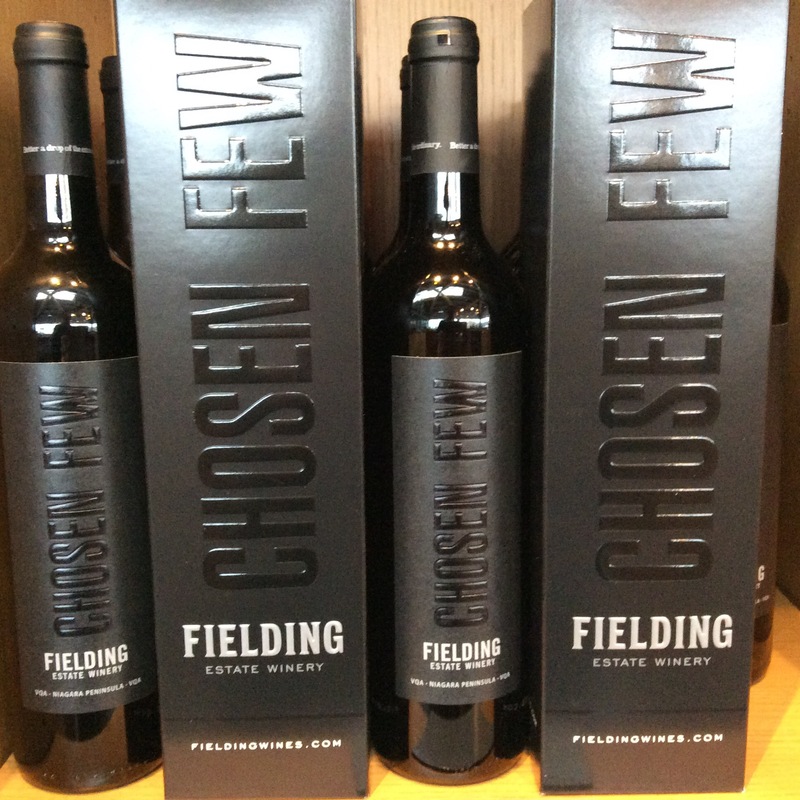 My last post was about my stop at Fielding Estate Winery and after a delightful start to my tour, as well as the recommendation of Katharine at Fielding Estate Winery, my next stop was Redstone Winery to try their aged Cabernet Franc Icewine pairing and their Syrah. 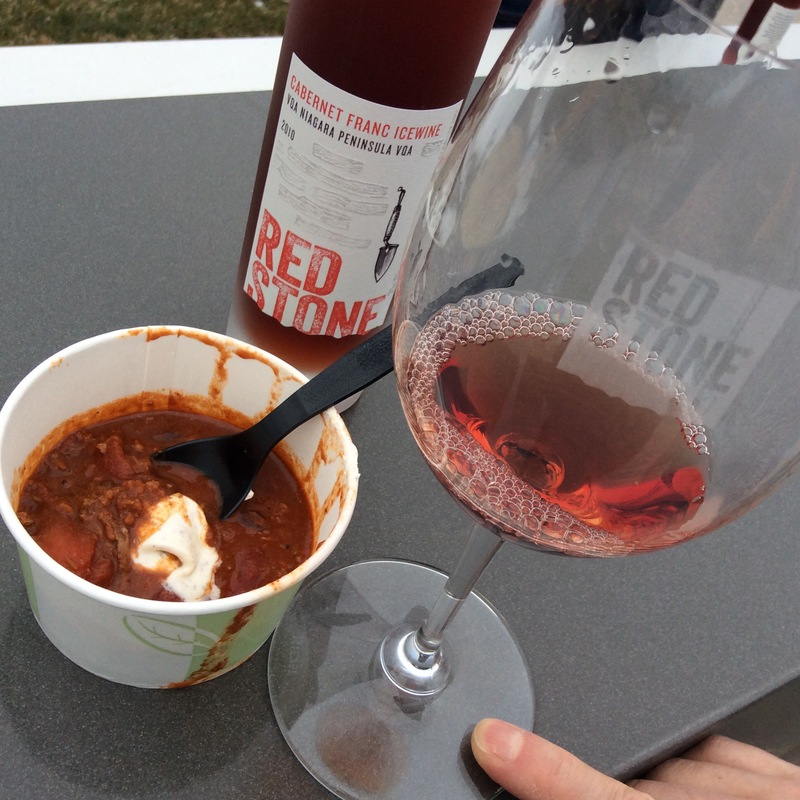 Write-up from the Niagara Icewine Festival brochure – It’s Gonna be ‘Chili’… Bundle up and join us fireside on the Terrace at Redstone to enjoy a cup of Chef Sider’s Icewine-inspired creation. A sweet and savory pairing of our 2010 Cabernet Franc Icewine with a Braised Venison and Dark Chocolate Chili is sure to keep you warm. 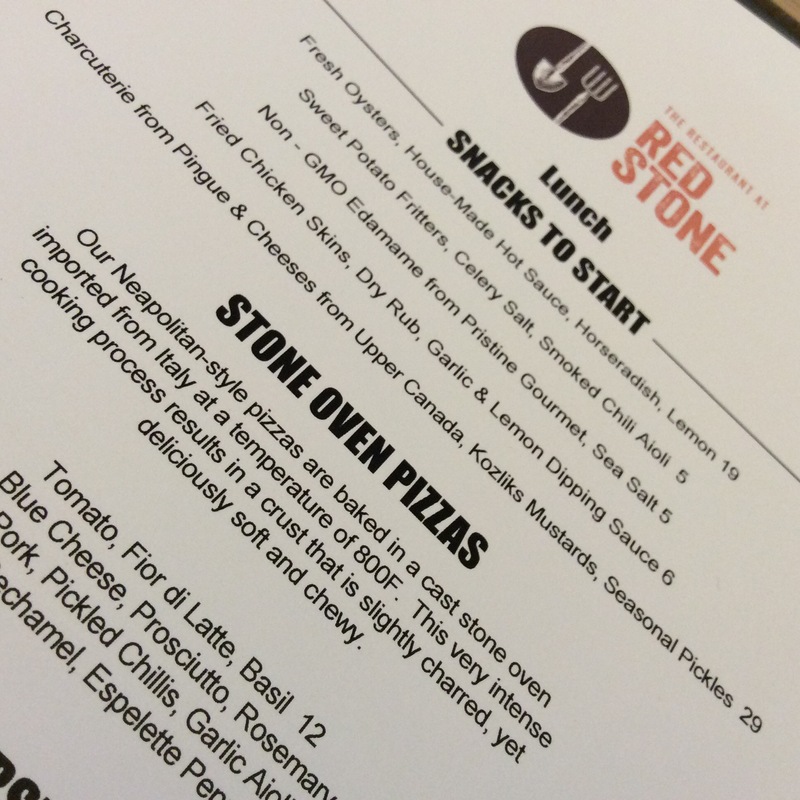 My first visit to Redstone Winery and my first time trying their wines. Somewhat understated on the outside, this winery with terrace and restaurant is simply gorgeous. The use of natural materials in the construction and finishing is beautiful. The Discovery Pass tasting was set on the terrace overlooking the vineyard below. An ideal setting save for the fact of the gusty wind blew over my glass spilling my sample. My cat-like reflexes saved the glass from smashing below and I told the sample guy to pour a bigger sample to prevent that from happening again. He did laugh, but didn’t pour a bigger sample. I retreated inside and took a seat at the bar to try the wine and chili. A steadying finger to save this glass from blowing over! The 2010 Redstone Cabernet Franc Icewine VQA Niagara Peninsula VQA had a colour of golden raspberry marmalade, a nose of strawberry compote and a slight whisper of sherry rancio, and flavours of strawberry rhubarb tart with a pleasant sweetness balanced gently by the tart, low acidity finish. A fine example of an Ontario Icewine with some age and maturation, with secondary and tertiary aromas at play. The chili on its own was big in its flavours of chili powder and cumin but overpowered the delicate nuances of the Icewine, turning it too acidic when tasted together. I can appreciate the intention of the sweet/savoury pairing but it just didn’t jive for me. While looking through the menus as I tasted my Icewine and chili I saw Fried Chicken Skins and thought to myself that it would be a crime to not try them. My favourite food item from the weekend, the crispy battered skins served with a garlic and lemon dipping sauce were exceptional, nicely seasoned with a spice rub with similar flavours as the chili. I will be back just for a double order of the Fried Chicken Skins! The Cabernet Farnc Icewine matched nicely with the fried chicken skins, both very indulgent in their own right, together the sweet and grease was an extravegent pleasure. 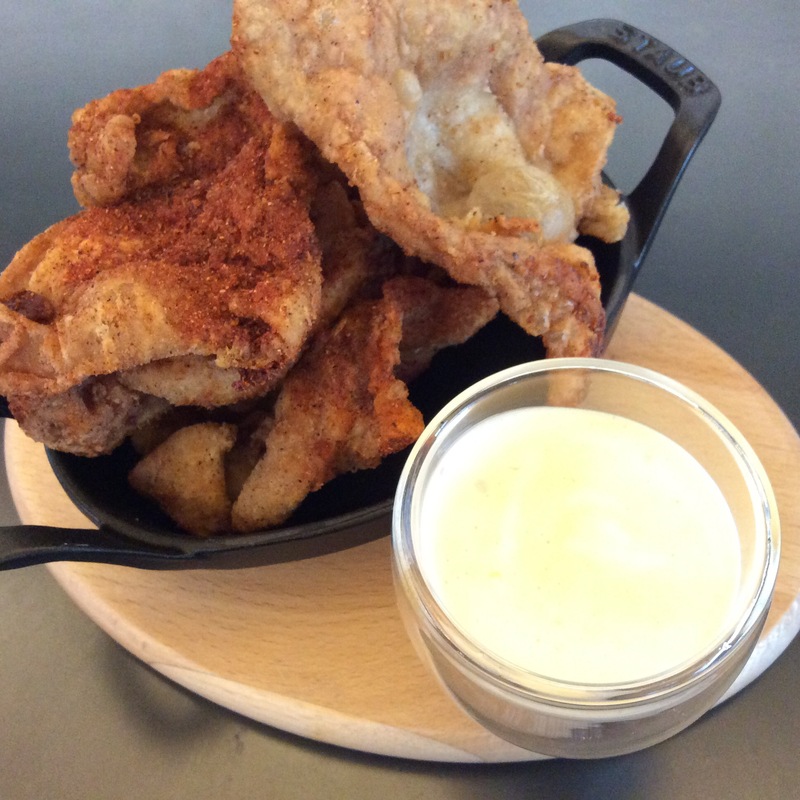 Fried Chicken Skins – Amazing! 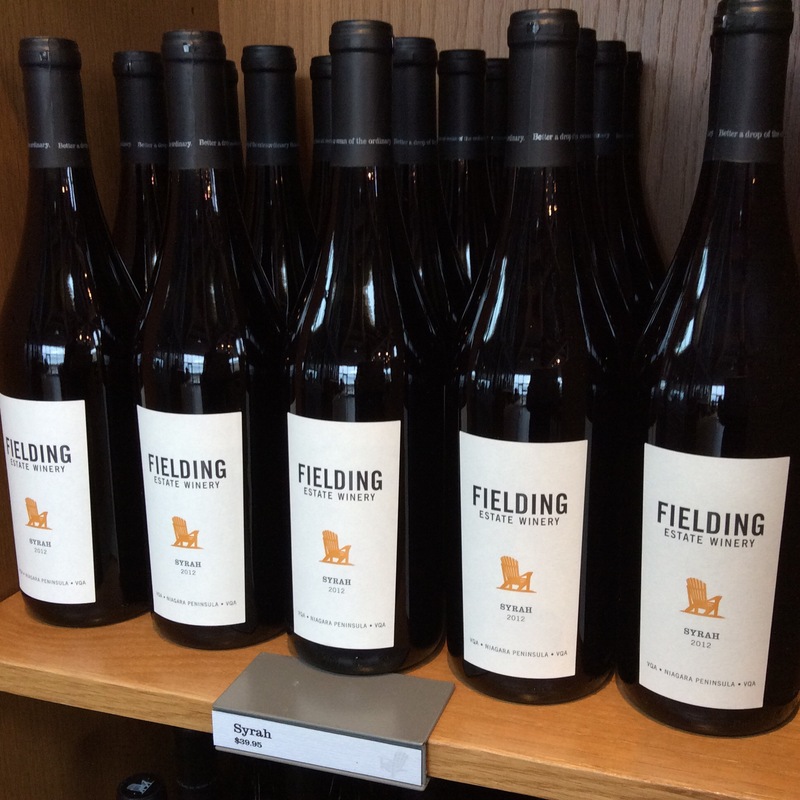 Katharine from Fielding recommended the Syrahs from Redstone so I tasted what they had on offer, their 2011 and 2012 that was just being released. 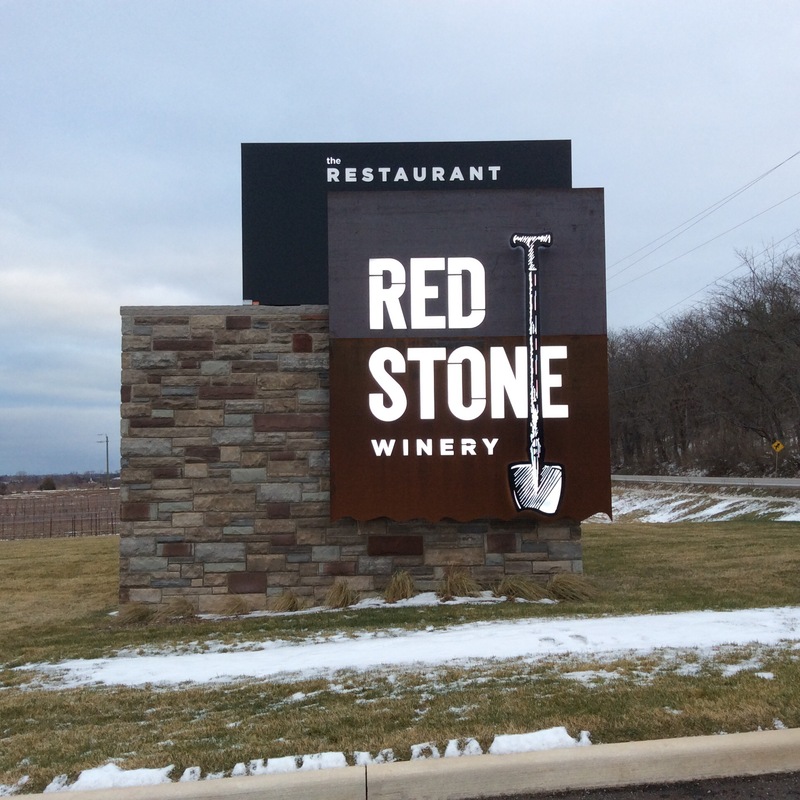 The 2011 Redstone Syrah VQA Lincoln Lakeshore VQA Redstone Vineyard was a pink crimson in the glass with aromas of tart red sour cherry and a light floral note. In the mouth there was still some tannic grip from the young tannins with finesse and crisp acidity on the pepper finish. Jelena at the tasting bar poured a sample of the 2012 Redstone Syrah VQA Lincoln Lakeshore VQA Redstone Vineyard, a warmer vintage in the Niagara Region compared to the 2011. The colour was similar to the 2011 with a little purple added into the pink crimson. The nose was cooked red fruit and sun-baked brick, replayed on the palate with brickish tannins, a rustic yet smooth and juicy finish. I found the 2012 more masculine in nature than the more feminine 2011. 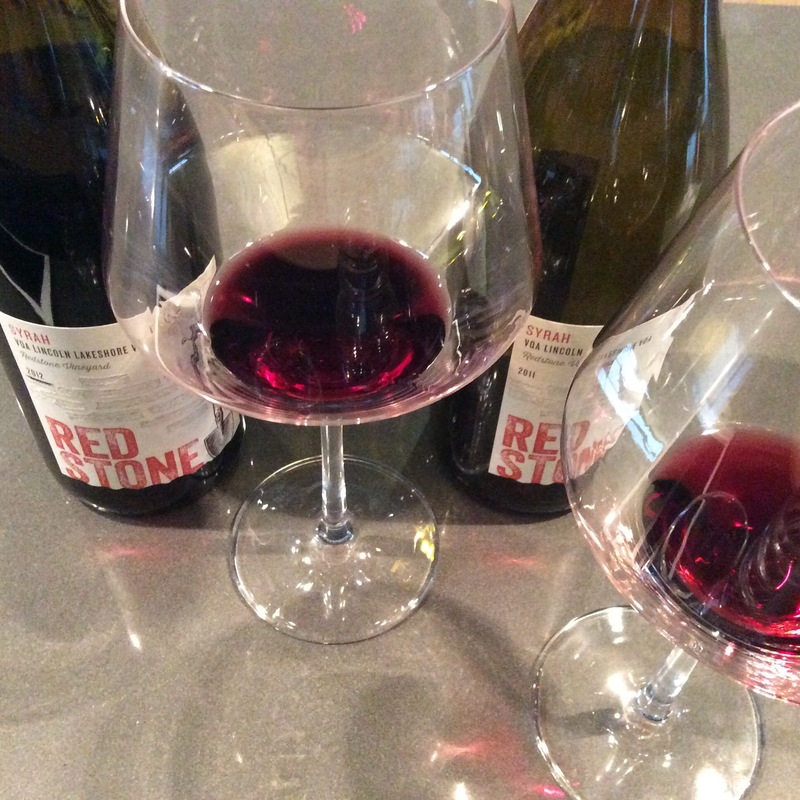 With a small sip left in each glass I combined the two for my own special Redstone Syrah blend and was pleasantly satisfied with the results, an Ontario Syrah that hit on all notes, the big fruit from the warmer 2012 and the delicate floral notes from the 2011. Truly a case where the sum is greater than the parts, the 2011/2012 was exceptional with ultimate balance and great harmony. I recently had the opportunity to head down to the Niagara Region for the 21st Annual Icewine Festival, my first time down to experience this event. I am a huge fan of Ontario Icewines and I was excited to use the Discovery Pass (still available for $40, more information here) to try some Icewine inspired wine and food pairings. As I was flying solo I had to be careful of my alcohol consumption and limited myself to four wineries over the two days I was down. One of the great things about the Discovery Pass is that it can be split between all the weekends that the Icewine Festival runs as well as between people. On this trip I visited Fielding Estate Winery, Redstone Winery, Megalomaniac/John Howard Cellars of Distinction and Inniskillin Wines. 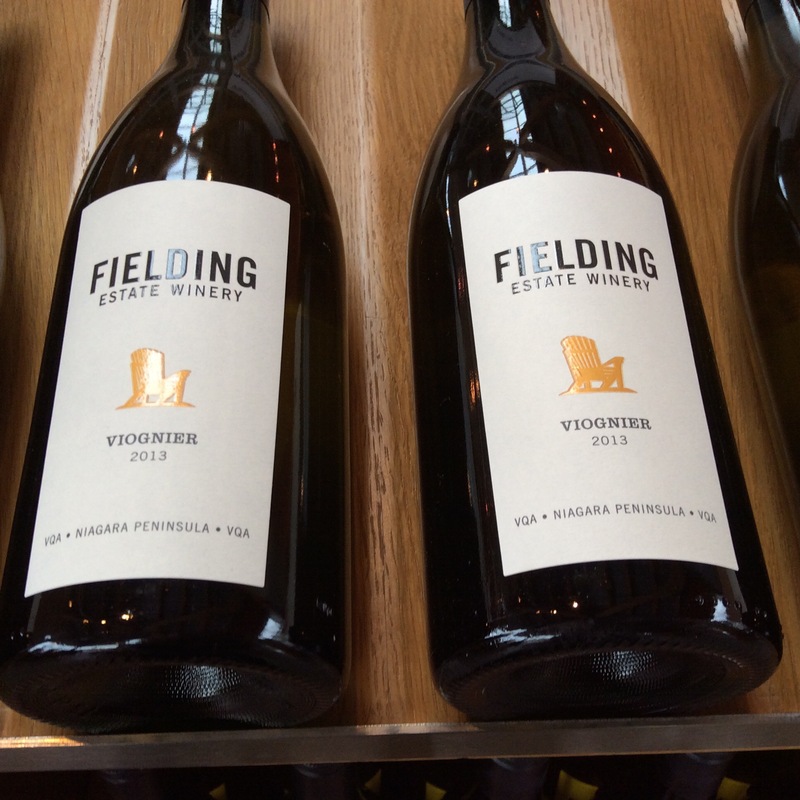 My first post is about my stop at Fielding Estate Winery with the other stops to be posted over the next few days. Icewine and nachos, a fantastic pairing! 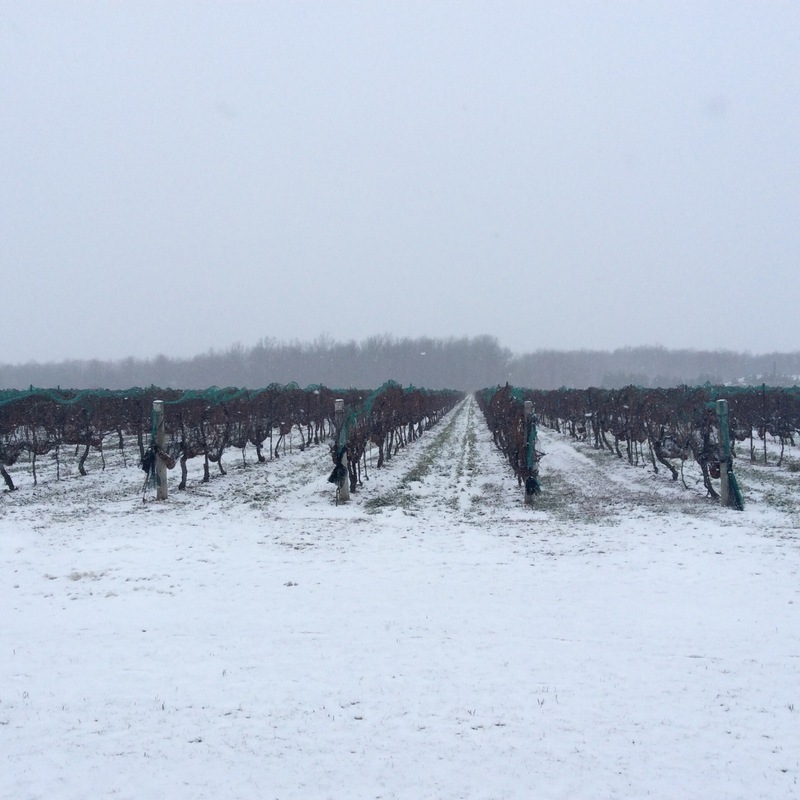 Write-up from the Niagara Icewine Festival brochure – Icewine Ole! 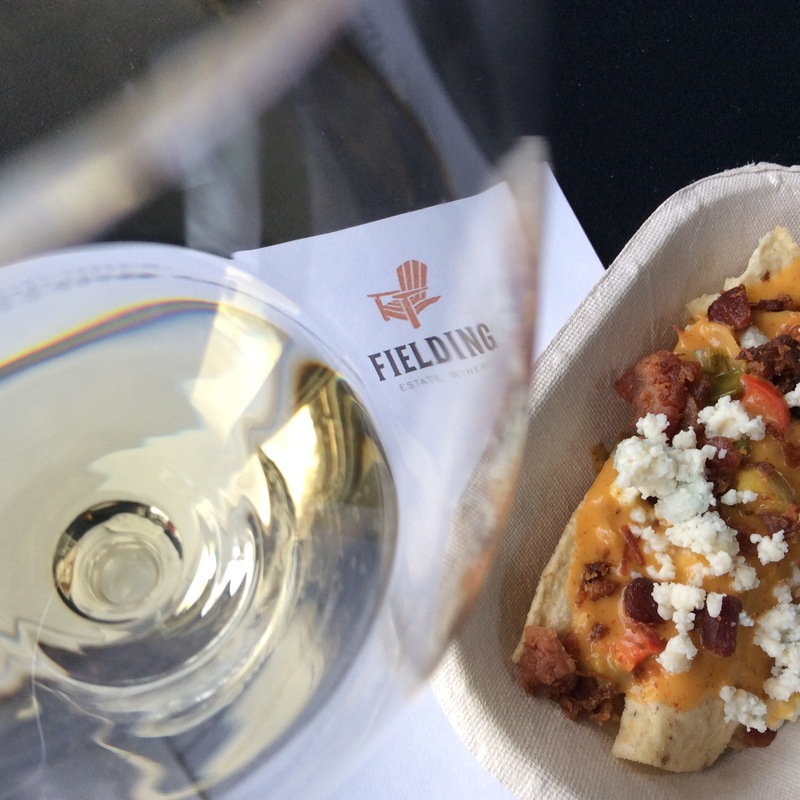 To celebrate the Icewine Festival at Fielding we’re serving up cheesy ‘Chile Con Queso’ nachos topped with crumbled bacon and blue cheese. Paired with our 2012 Riesling Icewine or 2012 Cabernet Franc it’s a fiesta not to be missed. First stop of the day and my favourite pairing of the weekend. 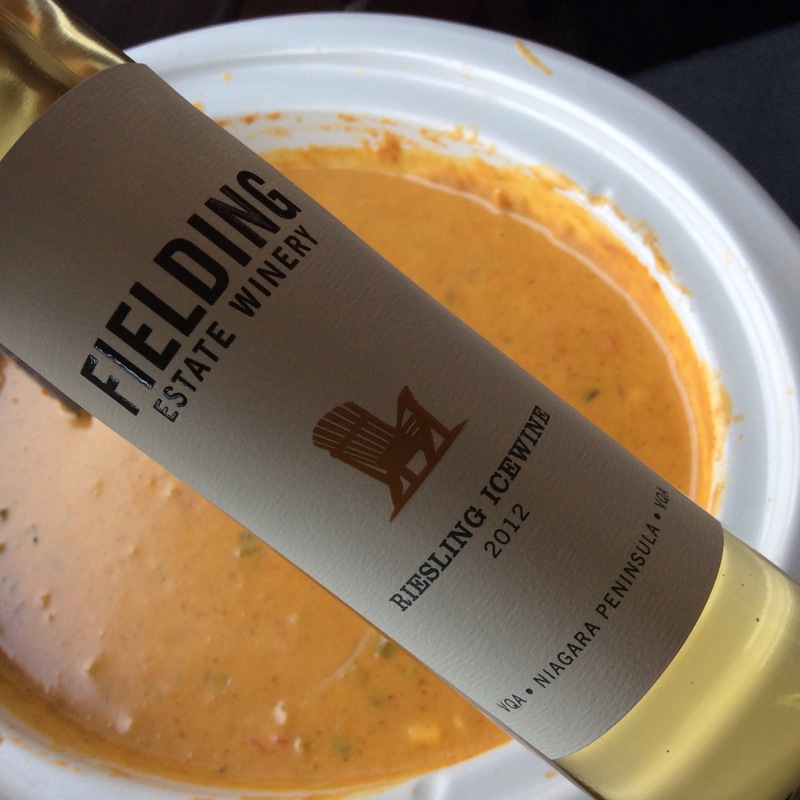 The 2012 Fielding Estate Winery Riesling Icewine VQA Niagara Peninsula VQA colour was a bright golden yellow hue with a nose of candied apricots and pineapple jam, flavours replayed on the palate with a mouth-coating slight unctuousness, sweet with a light seam of acidity. I enjoy the classic blue cheese and Icewine pairing and this take with nachos gave a shabby chic playfulness with the added texture from the chips, a really nice cheese sauce and the pungent creaminess of the blue cheese. Simple yet luxurious, similar big flavours in each of the ingredients lead to very enjoyable pairing. After the tasting in the tank room, I went back to the retail space and tasting bar to try some of their other offerings, specifically their 2013 Viognier, 2012 Syrah and 2012 Chosen Few high-end blend. Pale, pale faint tint of pale yellow, like clear water. Nose of peachy apricots, with some time a hint of candy floss. Flavours of stone tree fruit and touch of fresh lime, crispness from the cooler vintage year. Dark red, semi-transparent. Nose of brick pepper spice. Androgynous in nature, not masculine or feminine in style, somewhere either in between or outside. Fresh red fruit and pepper (green peppercorn?) in the mouth. Balance of fruit and spice. A blend of Cabernet Franc, Cabernet Sauvignon and Syrah. Translucent crimson, clean and clear. Fantastic aromas of toasted marshmallows on asphalt and Brunswick Stew. Vibrantly youthful in its tannic crispness, the dark fruit is balanced by the other big flavours that march across the palate. Drinking very well now, great potential for more to evolve from this wine.